With the driest climate in Spain, Almeria was a poor province and later than some neighbouring provinces to get on the tourist trail due to a poor infrastructure. This has now changed and Almeria has been able to learn from mistakes made elsewhere maintaining many unspoilt areas and beaches. The main coastal resorts fall into two areas. South west of Almeria city are Roquetas de Mar, a medium rise resort with a long sandy beach on a flat peninsula jutting out into the sea below the Sierra Gador, together with Aquadulce, a smaller family resort with traditional hotels. Separated from Roquetas by the Punta Entinas - Sabinar nature reserve (with salt marshes, lagoons and reed beds providing a home for over 200 species of birds including flamingos at certain times of the year) is the modern resort of Almerimar with its marina. 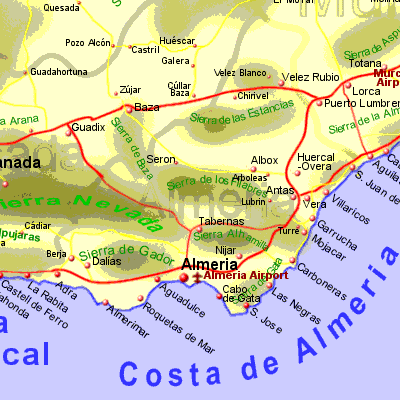 The second area of resorts is centered around Mojacar, north east of Almeria city. Mojacar Playa is a low rise resort spreading along the coast with sandy beaches between rocky areas. The old pueblo blanco of Mojacar sits on a hill 2 Km inland and is a maze of narrow streets, home to bars, restaurants, and small shops. South of Mojacar is the coastal town of Carboneras, with sandy beaches, developing as resort. North of Mojacar is the fishing town of Garrucha, the naturist resort of Vera Playa, and the small fishing village of Villaricos. Between these two resort areas lies the Cabo de Gata Natural Park, the only volcanic formation in Spain, with hills rising to 500m. The rock nature of the sea bed (though there are many sandy coves)results in exceptionally clear sea water. The main coastal towns in the Cabo de Gata are San Jose, Las Negras, and Agua Amarga. Inland from Almeria city is the Tabernas Desert, the only desert in Europe, and the location for the "Spaghetti Westerns" including "A fist Full of Dollars". At least 3 of these film sets are now tourist attractions. East of Tabernas is the pueblo blanco of Sorbas with its houses hanging onto the edge of a cliff. Inland from the Cabo de Gata, nestling in the hills, is Nijar, a good place to buy rugs, pottery, and Moroccan goods. Inland from Mojacar is the pueblo blanco of Bedar, and further into the hills, at the start of the Sierra Filabres, is the pueblo blanco of Lubrin. In the northern corner of Almeria province are the towns of Velez Rubio and Velez Blanco.